Unusual Afro-Oriental jazz fusion. The traditional oud and derbouka plus saxophones and electric bass create rich music with echoes of Spain, West Africa, Arabia, India and more. 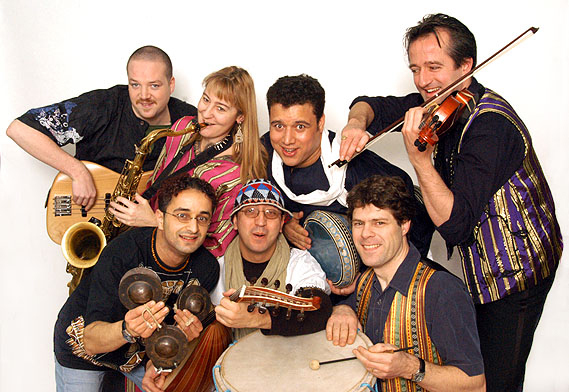 Fantazia play a unique and very contemporary style of ‘Afro-Oriental’ music, which draws on the vibrant rhythms and rich musical tradition of North Africa. Built around the original compositions of Algerian oud player Yazid, the music builds on a tradition that has, over the centuries, absorbed influences from many sources: Berber, Arab, West Africa, Spanish, Flamenco, Indian and many more. The fusion of many styles comes naturally to musicians from this part of the world, and Fantazia take this process even further. Fantazia’s irrestistible grooves create a sizzling party atmosphere that soon has any audience on its feet and dancing. Fantazia’s festival appearances include Bracknell Festival, The Oris London Jazz Festival, Window in the World (WOW), Morecambe Worldbeat Festival and Glastonbury, and they have performed at a range of venues including The Hackney Empire, The Royal Festival Hall Foyer and The Forum, Kentish Town. They have completed two tours supported by the Arts Council of England, and appeared live on Carlton TV’s The Warehouse, BBC World Service, Charlie Gillett’s GLR show and BBC Radio 4’s Loose Ends. The group were broadcast live on BBC Radio 3’s World Music Day. Three members of Fantazia worked on a feature film called ‘Hot Gold’ for which they composed original music. Although Algeria is best known, for many European listeners, as the home of Rai music, and Yazid has played with many leading Rai musicians, Fantazia are not a Rai group (though they may, of course, appeal to many Rai fans). Fantazia have a style that is their own. The group has a unity which stems from Yazid’s compositions, combined with a diversity that comes from the varied experiences all the musicians involved bring to the group.